Looking for places to drink in Kyoto should be easy, right? We have our Kyoto Drinking Guide to help find some places for you – except not all of them are open from lunch or early afternoon. I was on a work trip – aka a school trip – for a few days, and I had one day spare to do what I wanted. I was in Kyoto – so what else should I do but find somewhere to drink? The first stop was off to Yamaoka Saketen to pick up some beers and send them home. Except you can’t drink on site there. So after some searching I came across 100K Craft Beer and Pizza, and with it being a lovely autumn day in Kyoto, I decided to walk. And let me tell you, it’s one heck of a walk. 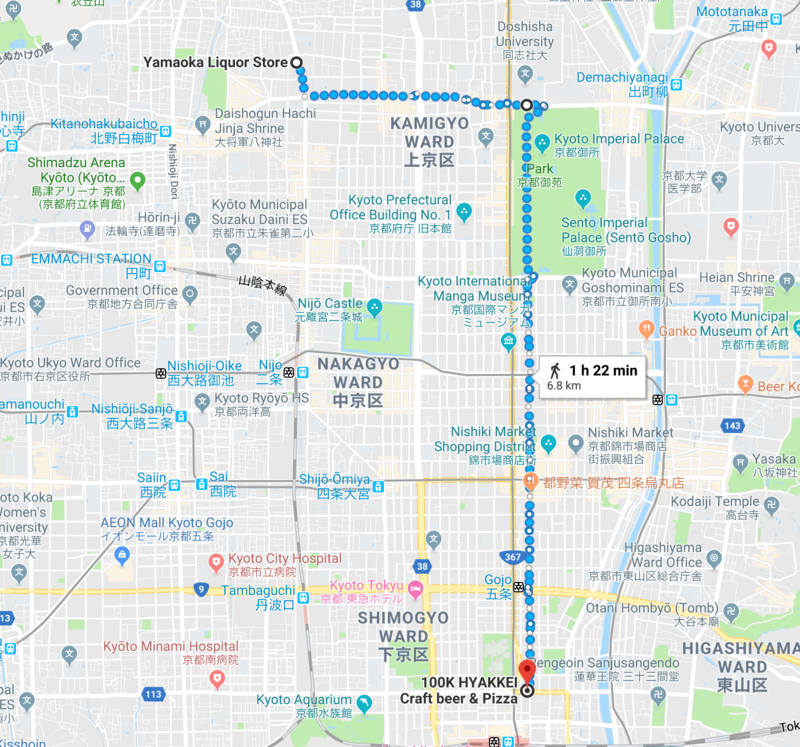 It’s easy enough – walk straight for the most part, with a few turns here and there, but it meant a trip through the Imperial Gardens. Then 100 Craft Beer and Pizza was closed for a private party until 3pm. So after some long walking around trying to find something for lunch, Kyoto Tower Sando came up on the search and I found a small dining area in the basement. Nice food but the better thing they had was a small shop called Kyodoai – which is number 5 on the map above. They have a selection of local craft beer from Kyoto that can be bought and drunk on site for no extra cost. There is also a huge selection of local sakes too. Some of the breweries included Tango Kingdom, Kizakura, and Kyoto Brewery. The selection does vary wildly according to the store owner though they also recommended Isetan Department Store Kyoto for more beers – and it’s worth a visit after their huge redevelopment. The closest station to Kyoto Tower Sando is Kyoto. It’s about a five minute walk to Kyodoai.